•Galvanized steel construction. 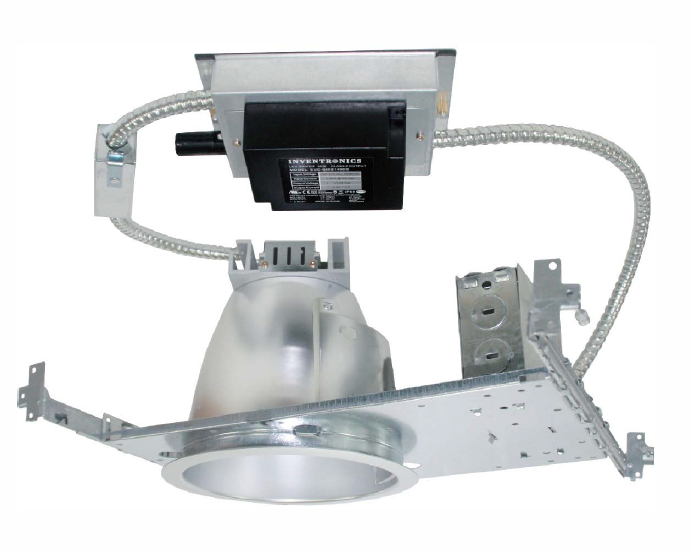 • Housing adjusts for ceilings up to 1-1 /4" thick. (For MCLR9W) •Aluminum extruded Heat sink designed to facilitate heat dissipation to reduce LED junction temperature for maintaining constant light output, color and life of solid state components. •Module construction includes LED, heat sink and lens. • Heavy gauge aluminum reflector anodized in clear, haze, gold, champagne and pewter color finish. Reflectors may provide with black and white milled groove baffle collar. • Listed for through branch circuit wiring. (Max.8 No 12 AWG 9o·c branch circuit conductors. (4 in, 4 out)) • (5) l /2" knockouts with true pry-out slots and (4) knockouts with Romex cable clamp. •Ground wire provided on J-box. • 24" Bar Hangers provide stability and support on joists and T-Bar Grid ceilings. • Housing can be positioned at any point within 24" joist span. • Score lines allow "tooless" shortening for 12" joists. • Include l 20-277V input high efficacy driver with the capability to dim using a Triac 120V low voltage electronic dimmer switch. • Driver feature power factor > .90, THD <20% and has integral thermal protection to sense over temperature or internal failure. • Driver mounts externally to the module, allowing future replacement, if needed. • Consult with factory for optional 0-1 OV analog dimmable driver. • 50,000hr of lamp life. Listing -ETL & cETL Listed.